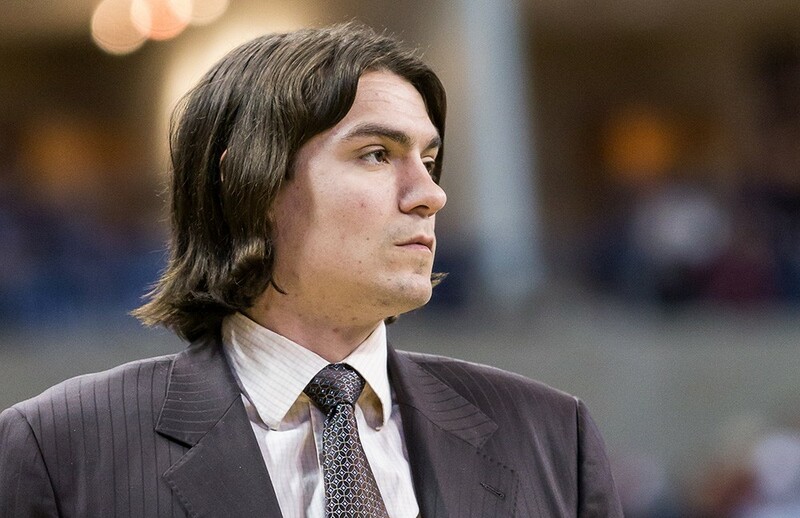 With his pro career behind him, Adam Morrison joined the Gonzaga coaching staff this fall as a student assistant. Adam Morrison watches his two daughters chase each other as the sun dips below the horizon, casting an orange glow through the living room of his home on the outskirts of Spokane. "Be careful," he says to his 5-year-old, who romps around the room with her 3-year-old sister. In the sports world, the 29-year-old Morrison is a former NCAA scoring champion, an NBA lottery pick with two world championship rings. He's a guy who hoops fans argue is either one of the greatest college basketball players of all time or one of the biggest disappointments in NBA history. Then there's this other Adam Morrison, the one who's now wrapping up his bachelor's degree with his sights set on a coaching career. That's the Morrison — about an eighth as introverted as we've been led to believe — feeding his kids dinner on this Friday night. The older daughter runs up to her dad, who is wearing a vintage Captain America T-shirt and sweatpants, his trademark long locks pulled behind his ears, and jumps up onto the couch. "Do you want to sit and listen?" he asks her. She nods and curls up with Morrison as he talks about his transition — going from professional player to coach — and outlines his life story that, in many ways, forms a loop. It returns to Mead High School, where he demolished scoring records and nearly won a state title, all while dealing with diabetes. It also returns to Gonzaga, where his jump shot and passion became the stuff of legend. Life goes in circles like that, even if you're Adam Morrison. By the end of the winter of 2006, Morrison was one of the most famous athletes, college, pro or otherwise, in America. Or maybe he was one of the most famous people in America. It was tough to tell if you were in the Northwest during the mania of that year. There was a national curiosity with Spokane's unlikely hoops hero, the magnitude of which was hard to gauge. Morrison was leading the nation in scoring, often doing so with an intensity and throwback style that made him the darling of SportsCenter. Basketball fans were captivated and lobbed haphazard Larry Bird comparisons. The narrative of that season followed Morrison and Duke's J.J. Redick as they battled for the scoring title, Player of the Year honors and other accolades. The two eventually would wind up sharing the cover of Sports Illustrated. Rival student sections, however, ruthlessly mocked him. Maybe those kids had it out for the guy because of the mustache or the hair, but more likely, it was the fact that, as he did at Loyola Marymount on a February afternoon that season, he could drop 37 points on your team — in one half. 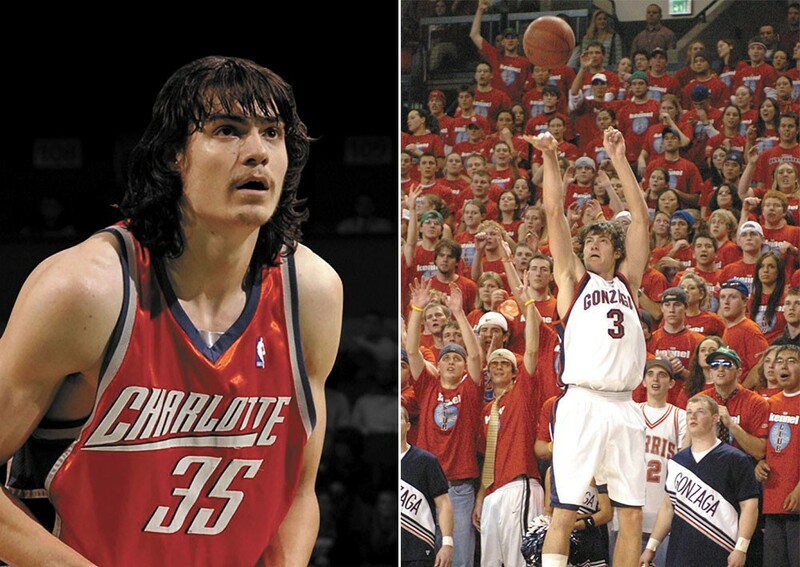 Gonzaga, Spokane and specifically Adam Morrison became the center of the college basketball world for a time. For Morrison, it was more than he bargained for when he set out to play college basketball. "I enjoyed the basketball part of it, but not the insanity of not being able to go anywhere. I felt like I couldn't go anywhere without stopping 15 times for a photo or an autograph," says Morrison. While he weathered what he called a "circus," some looked at his approach to the notoriety and labeled Morrison an introvert. Or worse, some even called him rude if he — just 21 years old and largely unprepared for the fame — didn't respond how people expected. "I'm not saying I'm not grateful, but if you came across wrong to one person, then you're a jerk to the whole city," he says. Things weren't much easier on that front when the Charlotte Bobcats, under the front-office instruction of Michael Jordan, selected him with the third overall pick in the NBA draft. Expectations were high, and while Morrison performed solidly during his rookie season, he blew out his ACL in the following preseason and had to sit out the entire 2007-08 campaign. When he returned, Morrison saw his playing time dwindle. Eventually he was traded to the Los Angeles Lakers, where playing time was even tougher to come by on a wildly talented team. He was, however, part of two championship teams and was credited by Kobe Bryant as a fierce competitor in practice. After being released by the Lakers and then failing to make the Washington Wizards in the 2010-11 season, Morrison took a break from basketball. By the next September, though, he was ready to come back. "I felt like playing again," he says of a career resurrection that saw him play in Belgrade and Istanbul during the 2011-12 season and later in the 2012 NBA Summer League. When Morrison then returned to the Gonzaga campus this past fall to resume his education, it was refreshing. To these kids, many of whom were in grade school during the peak of Morrison-mania, he might have stood out as exceptionally tall, but nothing else. "At first I thought it was going to be awkward, but it wasn't at all. The students were really nice," he recalls. "To be honest, some of them don't even know who I am. It's been eight years." In order to pursue coaching at the collegiate level, Morrison is completing a degree in sport management with a minor in political science. He's enjoying those poli-sci classes, "especially in today's political climate," he says. Some might remember the way in which the early profiles of Morrison in national publications were always quick to mention his interest in radical politics, namely Marx and Che Guevara. He's still heavily interested in politics and doesn't mind when our discussion veers into the politicization of television news coverage. He can hold his own in that arena, quoting from Einstein when needed. He laments far-left ideology as well as far-right thinking. These days, Morrison best classifies himself as a libertarian, acknowledging that the government can enrich people's lives but that government itself has gotten too big. He calls it a 180 from where he once stood. Even with kids, coaching and everything else in his life, being a full-time student is easier than he figured it might. There aren't the distractions of everyday college life this time around. And it also helps not being one of the most talked-about men in America. "One thing I don't miss about playing is dealing with the media," he says. It was a couple of weeks into the 2012-13 basketball season at Mead High School when head coach Glenn Williams says Morrison began hanging around the gym. As Williams tells it, Morrison kept his distance, sitting against a wall while the kids ran drills. Just two months prior, Morrison had been with the Portland Trail Blazers' preseason squad. He'd shown up at the NBA Summer League in Las Vegas that year and torched opponents, averaging about 20 points even after two years away from the league, during which he had played in Europe. The Blazers gave him a shot with the team, but no guaranteed contract. Seeing limited playing time throughout the preseason, Morrison was released and returned to Spokane, where he'd bought a house the previous year. Williams knew Morrison well. He'd coached him in high school at Mead and was at the helm of a team that made it all the way to a state championship game, where they'd suffer their first loss of the season despite 37 points from Morrison. Morrison had also been a teammate and good friend of Williams' son, Brian, who now serves as an assistant to his dad at Mead. Morrison kept coming back to the gym day after day, each time getting more involved with the team, and soon Williams saw a transformation in the guy he still remembers as a kid playing videogames with his son in the family's basement. Williams saw him shedding some of what he saw as a guarded personality Morrison had exhibited ever since becoming a college basketball rock star. He calls it "the old Adam." "Each day, he got more comfortable," says Williams. "With all that background he has, it was easy to step into that role, but the big thing was actually stepping into that role." By the end of the season, Morrison was an assistant coach, giving the kids the sort of help few others could. "There were times when he'd stop practice and say something like, 'Well, this is how we did it in L.A.' about a rotation we had. It's hard to argue with that," says Williams. For Morrison, it wasn't a careless decision. He knew he was making his first steps into coaching. After the Blazers had released him, he'd decided he wasn't going to try to play in Europe again. He wanted to get into coaching, following in the footsteps of his father John, who coached in the high school and college ranks before the family moved to Spokane when Adam was in grade school. "My dad coached 20 years. I've always liked it and thought I could pursue it. Once my career went sideways a little bit, I thought, 'Well, I can start coaching young and get in early and figure out how the system goes.'" When the season came to an end, Williams saw Morrison giving not just basketball lessons but life advice to players during their postseason interviews. The former NBA star sitting against the wall during that first practice was now giving impassioned guidance to kids he didn't know just a few months prior. Morrison sat at the end of the bench at this season's WCC tournament in Las Vegas two weeks ago. During regular-season home games (he didn't travel with the team in order to concentrate on school), he was actually behind the bench. Despite his credentials, he's hardly waltzing into a top spot on Mark Few's staff. When he first inquired about getting on the staff, assistant coach Tommy Lloyd told him he'd need to finish his degree, so Morrison enrolled in school, effectively picking up at the end of his junior year, right where he left things when he declared for the NBA draft a little more than a month after Gonzaga lost in the Sweet 16 that year. He's listed as a student assistant on a team with a coaching staff that already includes two other former Gonzaga players — Brian Michaelson and Alex Hernandez. The school and the team, Morrison says, were happy to get him back into school. "Gonzaga has been very gracious and they've helped me out in that regard. I'm really thankful for it," he says. Morrison has found his way into the fabric of Gonzaga basketball — something that's not all that different from how he remembers it from a decade ago. Mostly, he works with players individually on their skills. The X's and O's stuff will come as he progresses in his career, he says. But anyone who saw Morrison bear-hug David Stockton after the senior guard made the winning layup in the quarterfinals of the WCC tournament can tell Morrison still cares about the game. Head coach Mark Few says there's something unique about having Morrison on the bench. "He's got a unique position — a level of respect from our guys — that's unmatched when the guy's the Player of the Year in college basketball," says Few. "There's also a creative aspect that maybe you wouldn't get from some of us other coaches. Adam was a very creative player." Morrison is just trying to fit in where he can. "What I try to do is fit in somewhere in between [the other coaches]. I provide a viewpoint, because it's just like having a boardroom where you have different talents. It's like, 'OK, what can I bring that is different that still helps?'" It seems like your math is off if you think that in five years — presumably five more years of coaching — Adam Morrison will only be 34 years old. That's young for a coach or any other sort of professional. It's especially young for someone who has already made a hell of a lot of money in another profession from which he's already retired. Sometimes Morrison says he feels a little older than his 29 years. His knee — the one he injured in Charlotte, the one that very well may have been the reason his career never reached a level some figured it might — bothers him after a long workout. But not too bad, he insists. His diabetes means he needs to focus on his fitness, so he's keeping that in mind. But he's still finding time to play some golf, shoot his rifles, listen to music, keep up on current affairs and, of course, hang with his daughters. He's done a lot before 30.